"Care and Conservation of Historic Ceramics"
Do you have historic ceramics and want to know how to care and preserve them? In this course you will learn about the history and technology of ceramics how to identify conservation problems, how to properly handle, store, exhibit, and how to safely clean and preserve ceramics. We will emphasize what you can do and when you need a conservator. 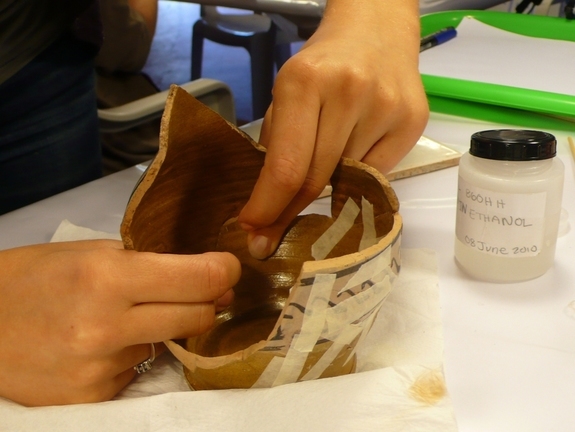 The course has three sections: History and Technology of Ceramics, Condition and Treatment, Storage and Care. It is structured so you can do the course from home or from work. We'll have email discussions about each week's readings and resource materials, there will one practical assignment. This online class will give you the tools to understand, clean, and preserve historic ceramics. If you have any questions feel free to email me any time. Please include name and email of the person taking the course.